Mine needs a .310 bullet when shooting cast, variations in bore sizes is pretty common with them. The Army never used lead bullets in the Krag, the original bullet was a long , heavy, round nose jacketed bullet, I believe 220 gr. But the bullets had an open base, not solid jacketed at the base like modern hunting type bullets, so upon firing, the base of the bullet could actually expand or to seal the bore. All early military rifles were made with varying GROOVE diameters , The bore dia were always close . They were bore riding the bullets and did not care about groove dia . The grooves do not wear , the lands will wear first and more . Just like tires , the grooves in them do not get deeper . All military of that time used bullets smaller tham the groove dia . I have 2 Krags a carbine and a long rifle with different bores. the carbine is a 1894 bore .304/.312, the rifle an 1898 bore .300/.310. these figures are from the bore casting. The 8x58R Danish (and Swedish) cartridge was developed in the era of BP, with the change over to Smokeless (or semi-smokeless) Powder. Bullets were cylindrical and long, whilst Grooves were deep (BP Practice). Excess Friction from a Long bearing surface on the Lands was reduced by making the Bullet of a diameter intermediate between Bore (8mm-.315" ) and Groove depth (.329-.330"). This Principle was used on all the 1886-1890s Long cylindrical bullets with Metal Jackets...The Flat or concave Base of the Bullet "Upset" to fill the grooves and give Obturation ("Base Upset Obturation") and created a driving Band effect, whilst the rest of the cylinder was lightly engraved with the rifling. This Method of combining Bullet and rifling is usually called "the Austrian Technique" as Steyr was the first to manufacture rifles to this system in 1888. It will be found in all "8mm" Rifles, mm 7,62 (Russian), and in the Commission 88 (Germany). In effect, all rifles with long, RN, heavy Ball cartridges. So to fit a bullet for the 8x58R Danish/Swede, one needs a RN, Flat Based .324" Bullet; if one wants to use a Spitzer Boattail, then one must use a .329" Bullet ( Boat Tails don't "Base upset obturate", so a BT .323 or .324 would suffer "Windage" and subsequent inaccuracy.) This was found in 1930 ( Austria) with the improvement of the .324" 8x50R to the Spitzer .329" 8x56R ( with Boat tail...the reduced contact area and the boat tail both required the "Upsize" to prevent windage. Now: to get Bullets for .324 in the 8x58R...use RN Jacketed Flat based "8mm" bullets, or make your own Spitzer BT by sizing down Hornady .338" in a Lee .329" Sizing die and use a strong (Cast iron/steel) O-frame Press; or cast and size Lead to .329"
Or buy .329" 8mm M30 S bullets from AV Ballistics Technical Services (Australia)...CNC turned Brass to M30 (8x56R Profile, but 172 grains only...60/40 Brass vs. 205gn Lead core steel jacket Milsurp.) Or even Pull down 8x56R ammo for the .329" FMJs. 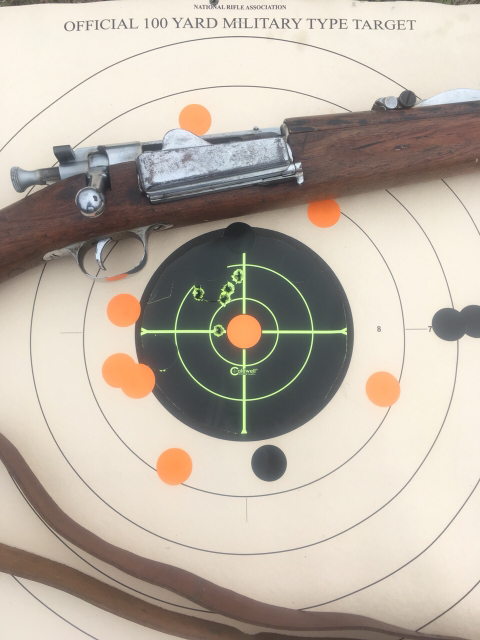 Best for the M1895 Swede RB in 8x58R is the RN FB .324 diameter Jacketed, or the Cast Lead at .329"; although later used with the improved Spitzer 8x58R later in its life, the RB prefers the (milder) Loads of the RN Bullet....and the rifles are too nice to use with spitzer bullets..."out of Character" and "out of Era". Quoting that guy is not the thing to do . He is personally the major source of mis-information on the internet . Since he has not real rifles nor does he shoot , his only source of info is about 50 other sights where he copies and rewrites stuff he does not understand . The "1888 Austrian " whatever , how about the French 1886 Lebel . How about the 1884 Swiss work with smallbore jacketed bullets ? If he did have any Swede 8x58r rifles and shot them , he would know they used TWO different bore sizes . A smaller one for the later ammo , and it was used as a replacement on the earlier rifles if they were rebarreled . He stole some of the above from one of my articles , but got it all mixed up . My Krag also likes .311 bullets. Slowbob is correct as to the fairly uniform bore diameters of the Krag and other early rifles - that is because the bore diameter is established by reaming, and a properly designed, sharpened and operated reamer cuts VERY close to size, thus, the nominal .300" bore diameter of the Krag and other U.S. cal. .30 rifles does not vary much from that standard. The specified standard groove diameter, on the other hand, has always been the same in U.S. cal. .30 barrels - .308" (groove depth of .004") - and the standard cal. .30 bullet was always of the same diameter (.308"). Groove diameter is established by the rifling operation, and the operators (and inspectors) apparently did not pay much attention to the depth of the finished grooves. Why this is so, I do not know, and cannot readily understand, having made many hundreds of barrels on precisely the same type machines as were in use at the Springfield Armory at the time, while maintaining groove depths to within .0001' - .0002' ( 1 to 2 TEN thousandths). Admittedly, I did not work so quickly as the Armory workers, but am sure that, had they simply used a 'Go' gauge for minimum groove depth, and stopped the rifling operation when the gauge entered the bore, the problem would not have been so pronounced as it definitely was/is. Then, too, experience gained in operating the rifling machine should have given the operators a definite 'feel' for how to set the cutter advance mechanism to stay within the established standard, especially since they were making the same thing over and over, rather than a different caliber, rifling pitch and groove depth nearly every time, as is usual in custom barrel making. I have measured a large number of Krag barrels, and the average groove diameter is ca. .310" or a bit larger - the largest I have personally measured was .314", and none of the barrels was obviously much worn or corroded. Also, the tightest Krag groove diameter I have personally measured was .309". Experienced riflemen of the Krag era, such as Townsend Whelen, were aware of the problem of over-spec. groove diameters in the Krag barrel, and were careful to obtain barrels as close to the nominal .308" groove diameter as possible for match shooting. What this boils-down to is that, in order to obtain the best accuracy from any U.S. Krag, the groove diameter should be determined as accurately as possible, and a bullet as close to that diameter as available should be used. Having said that, I will add that .308" bullets usually shoot very well in Krag barrels of not much over .309" groove diameter, and that bullets of .310", .311" and .312" diameters are available for use in those Krags which have groove diameters in those ranges.